The rescheduling of an auction – a first in my time at James and Sons. Yesterday was the day on which James and Sons’ second August auction should have taken place. This post is about what actually happened. I arrived at Fakenham Racecourse precisely as planned, which was about the last occasion on that day that anything could be said to have gone to plan. We were slightly late getting things set up. Then my computer failed to connect to the racecourse’s internet as their set up is not secure enough for my computer’s liking. Another laptop having been located it then became apparent that we would not be able to run video, although the audio seemed fine. Just after lot 923 went under the hammer we finally and definitively lost our audio as well. Discussion with the folks at the-saleroom.com, which included them being given remote access to one of our computers failed to resolve the situation, and after 15 minutes attempting to resolve the situation we decided that the only option was to postpone the auction, so on Friday 8th September at 10AM we will be having an auction at our shop which will start at lot 924 and end at lot 1600. Once the we had got the stuff back to the shop we got the auction officially rescheduled and I sent out a bulk email and a press release about the new auction. Here are both documents, and all the images used in their creation save for that of the record. I know I got the date wrong on this one – I was very tired and failed to notice. Some recent internet finds and some of my own photographs. This post features links to some recent internet finds and some of my own photographs. 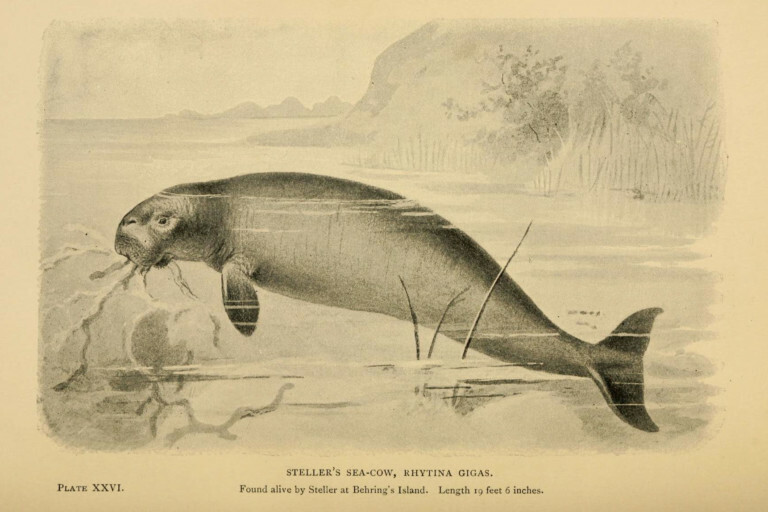 Steller’s Sea Cow holds the the world record for rapidity of extinction. Illustration from “Extinct monsters,” London: Chapman & Hall, 1896. Photo via Wikimedia Commons, licensed under CC BY 2.0.
vlogexpedition have a piece about the world’s longest railway journey – that along the Trans-Siberian railway. My next piece comes from Vox Political, who got direct from the person whose story it is, Paula Peters. The title of the piece “Bus driver subjects disability activist to humiliating discrimination” gives you a good idea of the nature of the story. British law on this matter is unequivocal – the bus driver is legally obliged to give wheelchair users priority over mothers with buggies (this courtesy of a court ruling in January). Given the completeness of the information Paula provides, the bus company in question have only one option open to them both legally and morally – they must sack the offending driver and must make sure that all their drivers are aware of their responsibilities to disabled passengers. First in this section comes a link to RobertLovesPi’s Blog for this piece titled “A Twisted Expansion of the Truncated Octahedron“, which features a very cool graphic. The Skwawkbox have produced an excellent piece titled “ATTACKS ON PIDCOCK SHOW MORAL BANKRUPTCY OF RIGHT – IN OR OUT OF LABOUR” Laura Pidcock is the recently elected MP for Northwest Durham and she has been making waves for her unashamed hostility to Tories and her criticisms of the cosiness and clubbiness of the House of Commons. I started this post with a couple of science and nature related links, and now as we approach my photographs we are finishing where we started with stuff about nature, first of all Cindy Knoke with a wonderful post about a castle that has been dedicated to raptors, titled “Castle Rapture“. With the last word before my photographs is Anna, who has recently posted part 13 of her amazing Paradise on Earth series, this time focussing on some of the smaller creatures who live in and around Trosa. I will start this set of photographs with some of the smaller creatures I have recently captured, before finishing with some general pictures. These pictures were all taken yesterday. Official publicity for Heritage Day 2017 in King’s Lynn. I have mentioned Heritage Open Day 2017 several times in this blog, including the fact that I will be stewarding at 11-13 King Street between 12 and 2PM. The official pamphlet for the event is now out, and with just less than two weeks to go I take this opportunity to share it with you. An account of the first of James and Sons’ two August auctions. As I have previously mentioned the presence of a Bank Holiday at a crucial time means that James and Sons are having two auctions in August. The first took place yesterday and is the subject of this post. The second will take place on Wednesday, with setup happening on the Tuesday. These lots would take somewhat in excess of five hours to sell at our usual rate of progress. The coins by and large sold well, with several bidders in the room and some action online. The stamps were quiet although some did sell, including a Chinese stamp which went for £85. The postal history also started quiet, but a large number of the later lots sold to an internet bidder. Some of the cigarette cards sold. There were some good sales among the postcards, and others which attracted no interest elsewhere were knocked down to a postcard dealer with whom the auctioneer has a regular arrangement. Each time an item sold to an online bidder whose name I did not recognize I noted their surname, paddle number and area of interest so that whatever else I have time to do in that respect actual bidders will definitely be added to the client database. The last lot went under the hammer at about 2:30PM, and I then attended to clearing up the IT/ electronic equipment, and as my last work related action of the day sent an email written by the auctioneer to the buyer of postal history regarding some of the earlier lots in that section that he might have missed (he is based in the USA, so the first postal history lots went under the hammer quite early morning his time). In total those items that did sell had a combined hammer price of just over £3,900 which made it a good day. We wait to see what happens on Wednesday. Lot 638 – I thought about bidding on this but decided not to – there is stuff on Wednesday that I want more than I want this.